Sports debates are the foundation of every fan’s night out. But it’s not enough merely to have these inebriated arguments—you must win them, too. 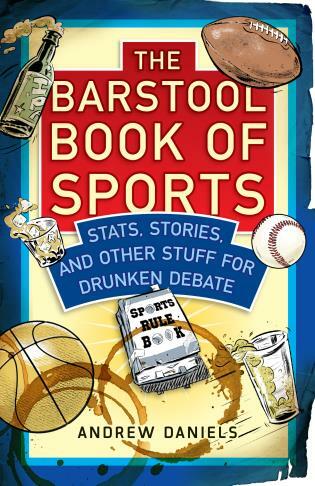 Enter The Barstool Book Of Sports: a disorderly debate bible that’s jam-packed with hilarious lists, irreverent sidebars, and edgy illustrations that will help you transform your sports knowledge and sound smarter and more confident than everyone else in drunken trivia duels—even when you can’t see straight. Forget boring “Player X vs. Player Y” fights. This book tackles the hard-hitting stuff: Who are the best fat athletes of all time? Where’s the saddest fan base in America? What are the dumbest athlete injuries ever? Which nonsensical sports conspiracy is just plausible enough to actually be true? Which NFL player should star alongside CGI animals in the football version of Space Jam? Consider it the ultimate toast to every intoxicated argument you’ve ever had. Andrew Daniels is a digital editor and veteran of Men’s Health magazine who has interviewed hundreds of athletes and celebrities including Cam Newton, John Elway, Drew Brees, Mike Tyson, and, uh, Vanilla Ice. He is also the author of a book: this one. A Lehigh University alum, Daniels currently lives in Allentown, Pennsylvania, with his wife and dog. In 2010 and 2011, he won back-to-back titles in his fantasy football league. He played two years of organized tee-ball.